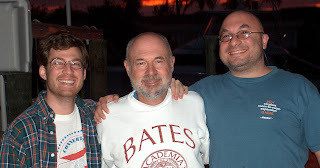 My older son Chris called today as well as my younger son Jonathan to wish me a happy Father’s Day. Nice to hear from them, but it was a reminder that life has become more complicated, more mobile and, for many, gone are the days of being able to get together for such occasions. Chris is in Worcester, Ma, 1,163 miles from here and Jonathan is visiting Shanghai, China, 8,195 distant miles (mileage courtesy of WolframAlpha, the “computational knowledge engine” – a useful site). Up Park Avenue we would speed to beat the lights from lower Manhattan in the small Ford station wagon with “Hagelstein Bros., Commercial Photographers since 1866” imprinted on its panels. The Queens Midtown Tunnel awaited us. It is some summer in the late 1950s and, once again, I’m working for my father after another high school year. In the back of the wagon I share a small space with props, flood lamps, and background curtains. The hot, midtown air, washed by exhaust fumes and the smoke from my father’s perpetual burning cigarette, surround me. My father’s brother and partner, my Uncle Phil, occupies the passenger’s seat. They have made this round trip, day-in and day-out since my father returned from WWII. Their discussions no longer center on the business, but they speak of the city, its problems, the Russians, and politics. I think of where my friends and I will cruise that evening in one of their cars, a 57’ Merc, probably Queens Blvd., winding up at Jahn’s next to the RKO on Lefferts Boulevard. Over the years, as a summer employee, my father believed I was being groomed for the business, the fourth generation to carry it on. My Uncle was a bachelor and I was the only one with the name to follow the tradition. There were cousins, but none at the time had any interest in photography, so the obligation fell to me. This was such an understood, implicit obligation for my future maturation, that nothing of a formal nature was needed to foster this direction. Simply, it was my job to learn the business from the bottom up, working first as a messenger on the NY City streets, delivering glossies to clients for salesmen’s samples and for the furniture show (the primary commercial product photographed by my father). Then I graduated to photographer’s assistant, adjusting lamp shades under the hot flood lamps so the seams would not show, and, then, finally to an assistant in the color lab, making prints, dodging shadows to hold overexposures of glass tables. Osmosis was to be my mentor. At work I see my father, as the camera would reveal contrasts with different filters. These were normally invisible to me. At home he was a more contemplative, private person, crushed into submission by a troubled marriage. But I see him strolling down the halls of his business, smiling, extending his hand to a customer, kidding in his usual way, “How’s Biz?” he would say. 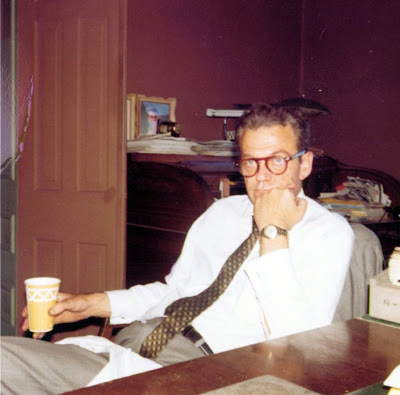 His office overlooks the reception area and there he, my Uncle, and his two cousins would preside over lunch, a burger and coffee from the nearby luncheonette. In spite of my obligation to learn the profession from the inside, I inveigled his support to go to college – with the understanding I would study business. By then I think I knew that this would be the first step to take me away from HIS business, a step, once taken, would not be taken back. The question was how to reveal this to him. But as silently as I was expected to take over the business, my retreat was equally stealth. We both avoided the topic as I went to college and I continued to work there during the summers. Once I switched majors from business to the humanities, we both knew, but still, no discussion. This was territory neither he nor I wanted to visit at the time. My reasons were clear to me. In the hallways of the studio he was larger than life but he was also provincial in his business thinking. He, his brother, and his cousins had developed an inbred view of the future of photography. Like Willie Loman, they had bet the future of their business on producing prints for salesmen, unconscious to the developing mass media and its impact on door-to-door sales. Entering the business would mean conflict with beliefs that were sacrosanct, a battle I would surely lose. So, I kept my silence and progressively moved away.